Solitude Lake is an alpine lake situated in the heart of Rocky Mountain National Park. Solitude is aptly named, as it is hidden from the main trail system, situated high above Glacier Gorge in the shadow of Thatchtop and Arrowhead Peak. 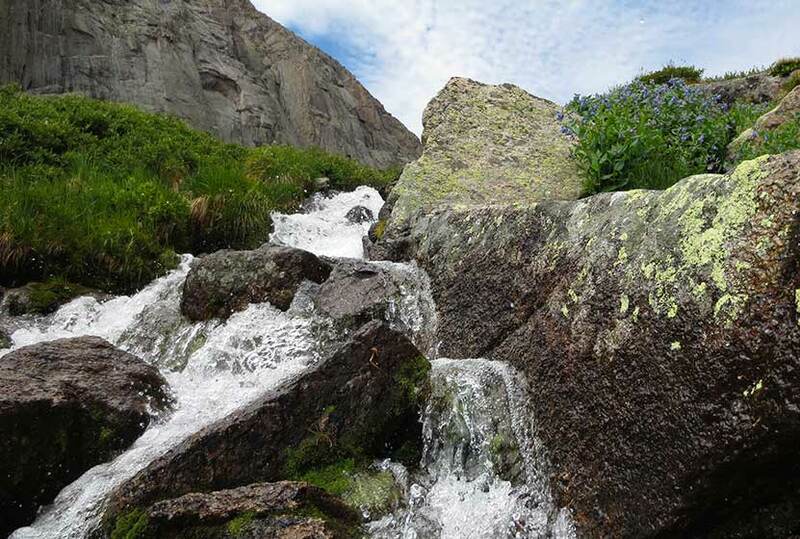 Because the hike to Solitude and its twin sister, Shelf Lake, require travel on unmaintained trails, it is best suited for more experienced hikers who are familiar with Rocky Mountain National Park and who are have honed their land navigation skills. Full details can be found in the trail profile for Shelf Lake. 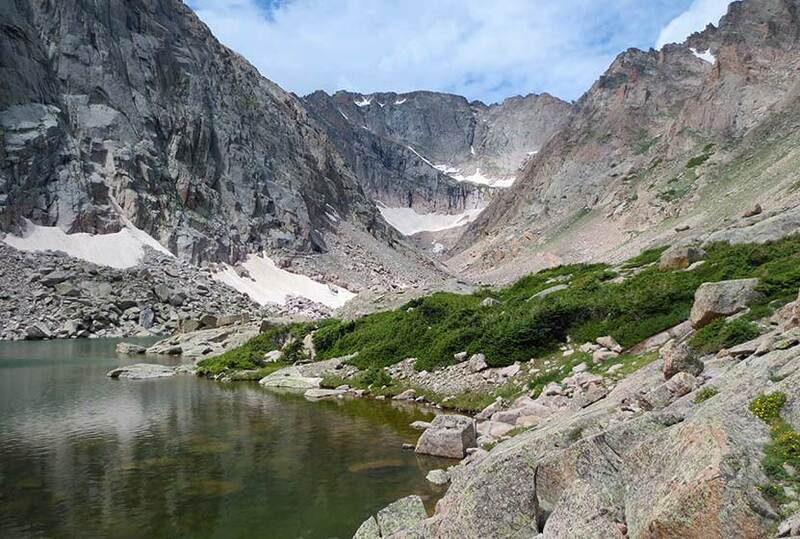 Explore the full Solitude Lake hike profile below for trail map, driving directions, and all the tips and resources for this hike in Rocky Mountain National Park. Solitude Lake is located about a quarter mile beyond Shelf Lake. Between the Shelf and Solitude are an unusual set of cascades, Shelf Lake Falls. 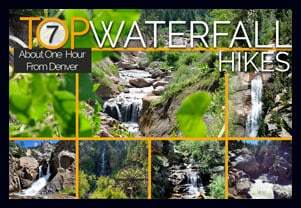 Above the falls, you’ll find a beautiful array of alpine wildflowers and breathtaking views of Longs Peak, Keyboard of the Winds, and the broad valley of Glacier Gorge. 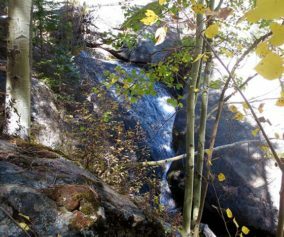 The hike up to Solitude take hikers past Alberta Falls, Mills Lake, and Shelf Creek Falls. 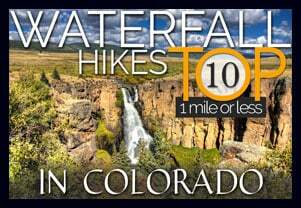 A final reminder: This hike is not on maintained trails, is a long hike, and demanding. 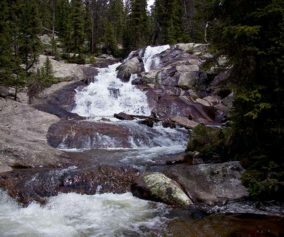 Hikers should be familiar with RMNP and developed the skills needed for backcountry travel. A more detailed trail profile for locating the trail and a brief description of its course and hazards are can be found on the Shelf Lake hike profile page. 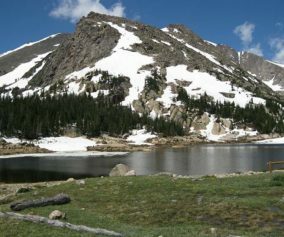 If you are looking for a demanding hike on maintained trails in Rocky Mountain National Park, we would recommend exploring trail profiles for Sky Pond and Black Lake. 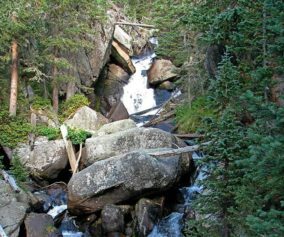 Recommended Map for Rocky Mountain National Park: The trail maps provided by Rocky Mountain National Park are usually sufficient. 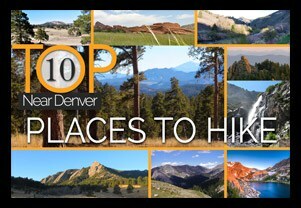 However, if you plan to hike RMNP often, we recommend purchasing a National Geographic Trails Illustrated Map.